This post has nothing to do with the Tigers, but I've always been intrigued by Red Sox outfielder Earl Webb's 1931 season when he set a record with 67 doubles. If you asked some random baseball fans who holds the record for most doubles in a season and told them it happened in 1931, they might guess a hall-of-fame slugger like Hank Greenberg or Lou Gehrig. They probably never heard of Webb, but that's what makes the record interesting. One of the fun parts of learning about players from past eras is that their paths to professional baseball were typically much different from players of today and Webb was no exception. According to Society for American Baseball Research historian Bob Nowlin, Webb was born on a farm in Blue Spring Cove near Bon Air Tennessee on September 17, 1897. When he was six years old, his family moved to nearby Ravenscroft. He wass involved in coal mining before and after baseball and first starting working at age 11 as a trapper opening and closing mine shafts for 5 cents per hour. At 14 years of age, Webb started pitching for the Ravenscroft baseball team and would sometimes walk eight-miles to play local rivals. As he matured, his arm attracted the attention of professional scouts and he signed to play with the Memphis Chickasaws of the Southern League in 1918. He initially failed to report but, after some prodding from his father (also a coal miner) Webb agreed to try his hand at professional ball in 1921. Memphis was still interested and farmed him out to Clarksdale Cubs of the Class D Mississippi State League where he would play as a pitcher and outfielder. Legendary Giants manager John McGraw saw him pitch in early April, 1922 and New York paid $10,000 plus two players to Memphis for the rights to his contract. He impressed more as a hitter than a pitcher and became strictly a pitcher by 1925. He saw his first action in the majors that year getting three at bats with the Giants at age 27. He would not see action again until he played for the Cubs in 1927. He didn't play a lot prior to 1930, largely because he was a poor fielder by his own admission. According to the Baseball: The Biographical Encyclopedia by David Pietrusza, Webb once said: "I have seen some mighty bad outfielders, but none of them had anything on me." 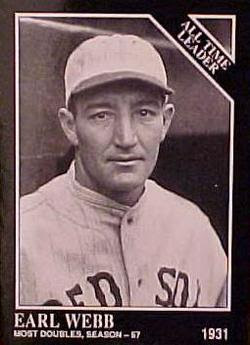 He broke through as a regular in 1930 at age 32 with the Boston Red Sox hitting .323 with 30 doubles and 16 home runs in 505 plate appearances. By season's end, he had a major-league record 67 doubles. That's a lot of doubles for anyone especially a player who never hit more than 30 in any other season. Why so many doubles? Was everyone hitting doubles that year? Not really. The second highest total was only 47 by Tigers first baseman Dale Alexander. In fact, Webb collected more two-base hits (48) by July 31 than any other player had all season. Was Webb helped by Fenway Park? It's hard to say how much of a park effect was present, but the Red Sox finished sixth in an eight-team American League with 289 doubles (including Webb's tally). Boston was seventh in doubles in 1930 and last in 1932. Nowlin reported that Webb was well aware of his assault on the doubles record (previously set by George Burns of the Indians in 1926) and that he might have turned some triples into doubles by holding up at second. How many times could that have happened though? It wouldn't have started early in the season as he surely had no plans of setting a doubles record given his prior history. He was not a huge triples hitter anyway, legging out six in 1930 and nine in 1932 compared to three in 1931. Webb finished in the top ten in almost every offensive category in 1931 including 7th in batting average (.333), 10th in on-base percentage (.404), eighth in slugging (.528) and 5th in OPS+ (149). He was clearly the hitting star on a team with finished last in the AL in runs scored and had no other regular with an OPS+ as high as 100. Webb was not the same in 1932 posting a 101 OPS+ with just 28 doubles and was traded to the Tigers during the season. He would never again approach the brilliance of his 1931 season retiring in 1935 after seven seasons with the Giants, Cubs, Red Sox, Tigers and White Sox. It's hard to explain Webb's 1931 season but, regardless of the reasons for his propensity for doubles his performance earned him a record that still stands 82 years later.